Carroll Go-Sam is Dyirrbal gumbilbara from Ravenshoe, North Queensland. She graduated with a B. Arch (Hons) UQ in 1997. Carroll is currently a lecturer in the School of Architecture (March 2019 to present). She has research interests in Indigenous architecture where it intersects with public, civic, social and institutional architecture. Her interests extend to identity themes drawing on professional experiences in rural townships in far-north QLD, the Northern Territory and south-east QLD. Carroll is engaged with research, education, consultation and design practitice, manifest in three key areas of architectural research and consultancy. 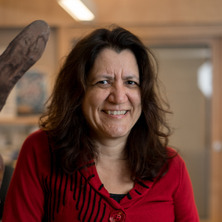 Carroll has engaged in research across design related fields: Aboriginal architecture, Indigenous-led housing management, policy, architectural identity themes, public facilities and civic space. Carroll has presented at national and international events, symposia and conferences including SAHANZ, IASTE, Brisbane Writers Festival, academic symposia, MPavillion Blakitecture. She was an Indigenous Design Place researcher (2017- March 19) and the recipient of an ARC Discovery Indigenous Award (2014-2016). Along with Professors Jane Hunter, Paul Memmott and Mark Moran, she developed the project; Defining the Impact of Regionalism on Aboriginal Housing and Settlement which sought to analyse, quantify and improve our understanding of Aboriginal and Torres Strait Islander housing needs. It developed a regional knowledge-base about needs assessment, by creating an interactive mapping interface sharpening focus on the blurred picture of the true extent of Indigenous household crowding, tenant demand, housing stock status and regional governance. The establishment a comprehensive knowledge-base through the development of innovative search, retrieval and visualisation services, the project generated a single online data model integrating qualitative and quantitative data with text based publications. Andrew, Brook, Neath, Jessica, Marino, Corina, Gilbert, Jock, Phillips, Christine and Go-Sam, Carroll (2019) Representation, Remembrance and the Memorial . Australia, Arch Media. Journal Article: Do Yugambeh-Bundjalung cultural landscapes matter? Go-Sam, Carroll (2018) Do Yugambeh-Bundjalung cultural landscapes matter?. Architecture Australia, 107 1: 51-53. Go-Sam, Carroll (2018). Gaps in Indigenous Repair. In Mauro Baracco and Louise Wright (Ed. ), Repair: Australian Pavilion 2018 (pp. 64-73) New York, United States: Actar Publishers. Do Yugambeh-Bundjalung cultural landscapes matter? Go-Sam, Carroll (2012) Resisting Brisbane. Brisbane, Australia, Finding Country project. Go-Sam, Carroll (2010) Sep Yama: “Ground you cannot see” Finding Country (a primer) (exhibition review). Interstices: Journal of Architecture and Related Arts, 11 154-159. Carroll Go-sam (2008) Working with and against Indigenous design paradigms. Architecture Australia, 97 5: 53-58. Go-Sam, Carroll (2014). Assimilating problems: from humpies to traditional houses. In: Christoph Schnoor, Translation: The 31st Society of Architectural Historians, Australia and New Zealand (SAHANZ) Annual Conference. Society of Architectural Historians, Australia and New Zealand (SAHANZ) Annual Conference, Auckland, New Zealand, (435-447). 2-5 July 2014. Go-Sam, Carroll (2011). Fabricating Blackness: Aboriginal identity constructs in the production and authorisation of architecture. In: Antony Moulis and Deborah van der Plaat, Audience: The 28th Society of Architectural Historians, Australia and New Zealand (SAHANZ) Annual Conference. Society of Architectural Historians, Australia and New Zealand (SAHANZ) Annual Conference, Brisbane, QLD, Australia, (1-27). 7-10 July 2011. Go-Sam, Carroll (2008). 'Lest We Forget': Working with and against Indigenous Design Paradigms. In: Which Way? Directions In Indigenous Housing. A National Conference Shaping the Future of housing for Indigenous communities. RAIA Indigenous Housing Conference, Alice Springs, N.T., Australia, (). 26-27 Oct 2007. Go-Sam, Carroll (1997). The Mutitjulu experiment : a study of decentralised houses designed by Paul Pholeros B.A. Thesis, School of Geography, Planning & Env Management, The University of Queensland. Go-sam, Carroll and Hotston, Paul, Shroud House renovation, Highgate Hill, Brisbane, Australia, .